When it comes to genetic research, fruit flies take the spotlight. They are often used to study specific genes, and researchers who find new genes get the privilege of naming them. The best way to study a gene is to mutate it and see what happens when the gene’s function is lost. As a result, genes are usually named after the phenotype caused by the mutation. For example, one of the genes I work with is amnesiac. As you can probably guess, flies with a mutation in the amnesiac gene can’t form long-term memories! This naming convention can often be very confusing for first-time fly students. One of the first genes we learn about is the white gene, which codes for eye color. Flies with a normal version of the white gene (usually written as w+ ) actually have red eyes, while flies with a mutation in the white gene ( w– ) have white eyes. Fly scientists have been getting away with choosing funny (and sometimes politically incorrect) gene names for decades. But over 75% of fruit fly genes are shared with humans, so not only would some of them eventually be found in humans, but they’d also be associated with a genetic disorder. And that’s where fly scientists can get themselves into trouble. For example, several years ago a gene named Hedgehog made headlines when it was found in humans. 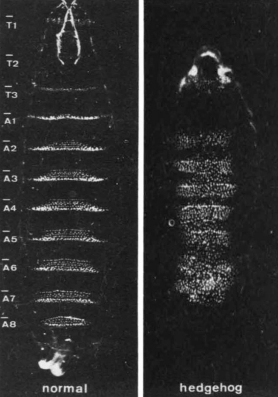 Image modified from Nüsslein-Volhard and Wieschaus, 1980. The Hedgehog gene was discovered in 1980, and was given its name based on the observation that a mutation in this gene led to spiky-looking larvae. Three versions of this gene were later found in humans, one of which was named Sonic Hedgehog (SHH) after Sega’s video game character. Unfortunately, this gene has since been linked to a human developmental disorder called Holoprosencephaly, in which an SHH mutation leads to severe brain, skull, and facial defects. Doctors soon began to protest having to explain the joke name to patients with extreme medical conditions. In 2006, the Human Genome Organization Gene Nomenclature Committee stepped in and changed some of the most offensively named genes. Another gene that was targeted was Lunatic Fringe, which was originally given its name because mutant flies had defects on the edges of their wings. In humans, however, mutations in the gene (which was renamed LFNG) leads a hereditary spinal defect called Jarcho-Levin Syndrome. Drawing by the talented artist at Drosophila Drawings. But despite these naming blunders, fruit fly research on these genes has and will continue to help in the search for treatments for these genetic disorders. And fly scientists haven’t stopped taking the opportunity to come up with fun names for newly discovered genes. Earlier this year, the Dickson fly lab published a report on “Moonwalker” flies: flies that couldn’t change direction and were permanently stuck walking backwards. Video: The left side shows a fly walking normally. 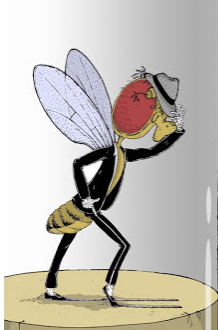 The right side shows a “moonwalking” fly unable to walk forwards.